Is the Baku-Tbilisi-Kars railway worth the fuss? Georgy Arutunov is a local citizen of Akhalkalaki, near Georgia's Armenian border, but he doesn't know a great deal about the Baku-Tbilisi-Kars railway (BTK) currently under construction close to his hometown. 'I have heard about it, but I don't know whether it's being carried out or not.' About a dozen local residents have given me the same answer—they know next to nothing about the grandiose 'project of the century' as the BTK railway has been dubbed. According to the contract, 70% of workers hired to construct the railway are supposed to be Georgian citizens. Marabda-Kartsakhi, the company responsible for construction, says that it is complying with all of the terms of the agreement. 'We employ specialists from Ukraine, Turkey and other countries, but in general, we recruit citizens of Georgia. Now the project employs about 600 people. When the road will go into operation, we will add another 1,000 employees,' said Levan Kankava, the Executive Director of Marabda-Kartsakhi Company. BTK is a joint project of Turkey, Azerbaijan and Georgia, and it aims to unite the railway systems of these three countries. Originally, the project was supposed to be completed by 2009, but the terms were breached. Then the completion date was moved to 2011, but that soon came and went. The deadline was then postponed several more times. The construction was finally restored after the Georgia's 2012 parliamentary elections, when, according to a company representative, Marabda-Kartsakhi underwent a management change. 'I do not want to look back and criticise, but many things were not completed then. When our new team started to work in 2012, only 20% of the work was completed. Now we have already completed 60%. We cannot promise to finish work by the end of the year – it is impossible, we need another two or three years. 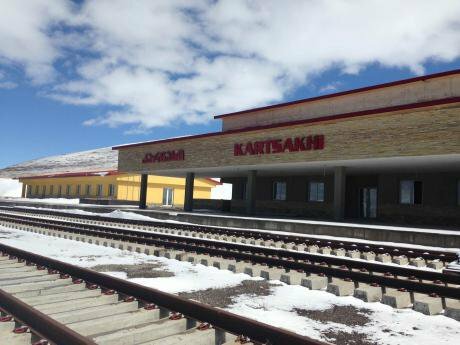 But we are ready to open it up to the first trains,' Kote Ninidze, CEO of Marabda-Kartsakhi, told me. The current capacity of the BTK is 5m tons of cargo and 1m passengers. In the future, it could be increased to 15m tons of cargo and 3m passengers. The route's total length is 826 km, and 180 of those kilometres are situated inside Georgian territory. The largest station in the Georgian segment is based at Akhalkalaki. The station building, designed by the German architect Jurgen Meyer, has already been built, but it is still enclosed with scaffolding, even though they should have finished both the internal and external work by now. 'From time to time we have to put it off because of bad weather conditions,' said Murad Buadze, a representative of Azeryolservis Company. 'Weather conditions are difficult to predict in Samtskhe-Javakheti. The usual temperature in winter is 25-40 degrees below zero. People argue that the weather is also cold in Siberia, but somehow they manage to complete building works much quicker than we do. But it’s impossible to work here when the winter wind is 20 meters per second. There is snow everywhere across the line; snowdrifts sometimes are two meters in height. Therefore the construction has been postponed. Now it is warmer, and we are ready to work,' Buadze added. Georgia had to take a loan out from the State Oil Fund of Azerbaijan (SOFAZ) to construct its section of the 'project of the century'. Initially, the cost of the project was set at $422m ($202m for the Georgian section alone). Later, however, the Georgian budget was increased to $775m. The first tranche was allocated in 2007 ($200m for 25 years at 1% per annum), and the second was allocated in 2011 ($575m for 25 years at 5% per annum). $100m is being used to rehabilitate existing railroads, the rest is intended for the construction of new roads. On average, one kilometre of new railroad costs Georgian taxpayers $24m. The majority of Georgian economists seem to agree with Salukvadze and they are confident that the new railway will open up great opportunities for the country. The Director of the International School of Economics (ISET) of TSU, Eric Livni, believes that any project of this scale is a good investment as it will strengthen Georgia's position in the region. 'Just look at the map, Georgia has huge transit potential. It links both East with West and North with South. At the moment, North-South orientation is not in demand but in the future it may be useful. In Soviet times 50m tons of goods passed through Georgia. Today, if you take into account Turkey, the potential is huge,' said Livni. According to Livni, despite the fact that BTK is primarily intended to serve flows from Azerbaijan, Central Asia and China are also showing interest in this alternative corridor. Armenia too could benefit from the project, despite being isolated from it. 'BTK has enormous potential. If it is possible to load goods from Tbilisi, there might the opportunity to do the same thing from Armenia. I cannot imagine that it will be possible to eliminate Armenian loads from the total flow. I would be very surprised if someone finds a way to hinder this. People find ways to carry goods to embargoed countries; I think they can do the same things here. You will not be able to distinguish Armenian products from others at a glance. I think it will open the same option for Russian goods to reach Turkey this way. In general, this way will increase the transit possibilities of Georgia, as well other countries who use it,' said Livni. Despite the predominantly positive assessment, some Georgian analysts are critical about BTK as they believe it will reduce the turnover of sea ports. However, most economists don’t share these fears. For example, economist Irakli Murtskhvaladze believes that ports and railway tracks will not compete each other. Whether the railway will meet the expectations and hopes of analysts will only be seen once the project is up and running.